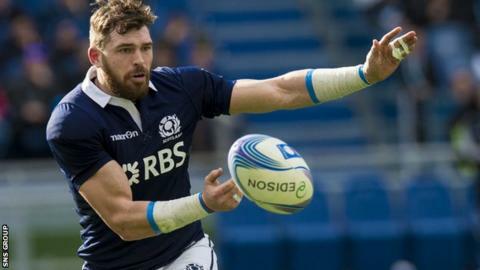 Sean Lamont, Scotland's second-most capped player, has no intention of stepping down from international rugby. The 33-year-old Glasgow winger/centre has 91 caps and hopes to add to his tally in the Six Nations, which kicks off next month. "I'll never retire," Lamont told BBC Scotland. "I'll only stop when they tell me I'm surplus to requirements. "I'll probably never better Chris Paterson's [record] total of 109 [appearances] but you never know." Scotland visit France on 7 February, followed by home games against Wales and Italy. A trip to take on England at Twickenham beckons on 14 March and the tournament ends with champions Ireland at Murrayfield. Lamont played in four Six Nations matches last season, including the solitary win over Italy. "It's a great honour playing for Scotland," added Lamont, who made his debut against Samoa in 2004. "I love it. "If I get to the World Cup that might get me to 100 [caps] and then we'll see what happens." Lamont's Glasgow Warriors team-mate Duncan Weir is an injury doubt for the Six Nations after sustaining an arm injury in the recent 16-6 win over Edinburgh. The fly-half is to have a damaged bicep assessed and may need surgery. "I would like to think it won't be the end of his season, but I think it rules out the Six Nations," said Glasgow head coach Gregor Townsend anticipating the worst. "With a bicep injury you are talking months rather than weeks."